Our client is a leading provider of media conversion services to share and convert videos and photos from videotapes to a digital format. Our client provides easy and inexpensive solutions wherein the converted media files are stored onto a DVD format and are also available online, to be accessible through a web application. Our client provides end-to-end solution right from receiving the tapes and photos to digitizing it and making it available for end use. The solution is based on best-of-class video engineering and automation technology for converting videos and photos into new, evolving digital formats. Our client’s digital transfer services are used by leading retailers and companies such as Kodak, Sony, and over 1,000 other businesses across the US. Our client was already a well established player in the digital multimedia conversion space, having provided a solution hosted on the cloud accessed through the web. 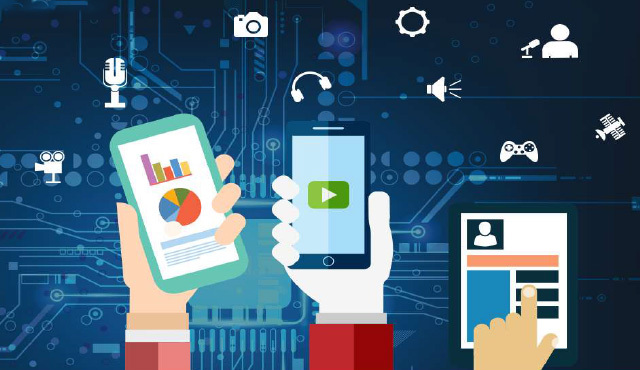 Realizing the huge potential of the media conversion services especially using the emerging mobile devices, our client wanted to develop the mobile version of the web solution with additional features. However our client’s technical team lacked the expertise for mobile application development and hence they were looking for a development partner with expertise in the mobile technologies and hands-on experience in end–to-end development of mobile applications, including publishing to the corresponding app market. Our client planned to reach maximum mobile audience by targeting the consumers on different and varied devices like smartphones and tablets. Witnessing the wide availability and the huge popularity of the Android platform, our client decided to develop the application for the Android smartphones and tablets. With the rapid developments and release cycles of new Android OS, our client wanted to ensure that the application should be so developed that they can be easily adapted so as to benefit from the features of the new OS releases. Our client has a huge video database with MP4 videos referred by the web application. These videos were to be provided in a streaming format to the Android applications. One of the important attributes of the existing web application was the rich user experience. This rich user interface was to be maintained in the mobile applications. Even within the Android family multiple smartphones and tablets are released by multiple manufacturers, each of these devices having different form factors and supporting varied video formats. To ensure universal compatibility, the proposed mobile application was required to support different device form factors and videos formats. To ensure that the application can be easily modified to follow the standards of and incorporate the incremental features of new Android OS releases in different makes of tablets and smartphones. 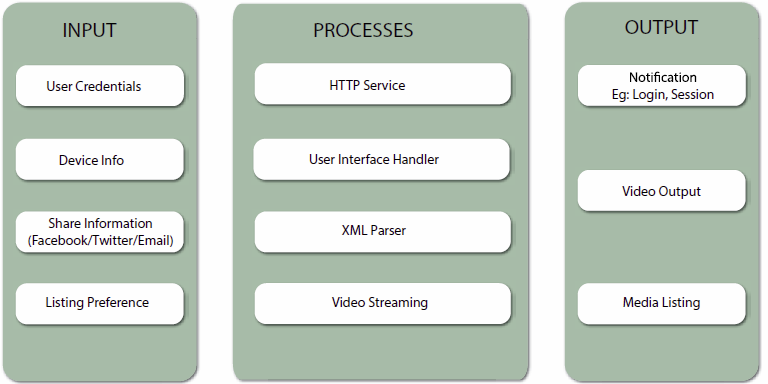 To provide the same user experience for video streaming as provided by the flash player in the web application. To provide support for different video formats like MPEG-TS, etc. supported on different Android versions. To provide support for different device form factors and screen densities available on 600+ devices available today. Xoriant has an established Mobile Center of Excellence with more than 60 members comprising of application architects, UI developers, developers and testers. Xoriant team had also developed and published several applications for the Android platform on several different smartphones and tablets. In addition the Xoriant mobile team has conceived and developed a Mobile App Accelerator and Enterprise Mobility Platform to accelerate the development of both consumer and enterprise mobile applications. For this engagement, Xoriant’s development team developed prototype screens using our Creative Design team, with utmost importance to the aesthetics of the application. Approvals were taken from the client for the UI screens which were developed in adherence to the UI guidelines from Android developer guide. Since the application was to be developed for different mobile devices including smartphones and tablets, modular components were developed that could be reused with minor modifications. Xoriant’s proprietary App Accelerator framework was used for rapid development, cutting down the efforts and costs needed to develop commonly used features and services. Project library tools were used and Wrapper modules were implemented to ensure backward compatibility with the Android OS. For example, to support lower versions, Wrapper modules were implemented for Action Bar/ Quick Action bar/ Fragment layouts which are a part of Android OS 3.0 and higher. An intensive listing of the OS and the hardware configuration was defined to enable developers to design and develop the application covering the maximum possible device – OS version scenarios. 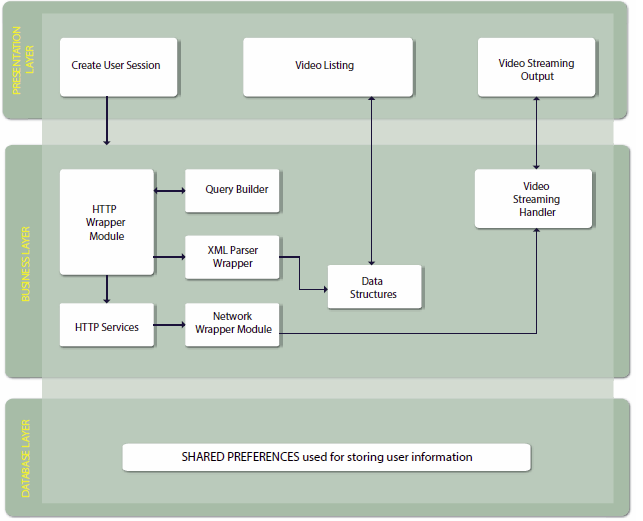 Different video streaming protocols like RTSP for Android 2.3 and lower & HLS for higher versions and video library tools were used to achieve the high quality video and pictures, as available on the web application. Since MP4 videos are not easily streamed on many of the Android devices, library tools were developed to convert these videos to other formats like 3GPP, as defined by the hardware configuration of the handsets and tablet devices. Resource folders with low, medium and high ranges of density pixel (dp) were built in the application to handle the varied form factors of different devices. To optimize application’s UI alternative resources were provided for the generalized screen sizes and densities. QA teams devised a test matrix to test different scenarios on actual devices and simulators. Different test tools like Robotium and Device Any where was used to perform aggressive functional testing. Used project library tools and implemented Wrapper modules to accelerate application development and to incorporate features of the current OS in the application while maintaining backward compatibility with lower OS version. Performed an intensive research to select the best fit protocols for streaming videos for devices with different OS versions. RTSP was used for Android 2.3 and less while HLS was selected for higher versions, thus obtaining a high quality video streaming matching the standards of flash player streaming on the web application. Developed different library tools to convert video from the existing MP4 format videos to different video formats supported by the Android OS versions. Developed and implemented different resources with low, medium and high ranges of density pixel in the application to support varied form factors of different Android handsets. Improved customer base by over 30% post launch of the mobile application on smartphones and tablets. Achieved quicker product releases and lower costs by using Xoriant Mobile App Accelerator Framework. I would like to acknowledge Xoriant for their efforts in developing this application within a short time. Xoriant’s technical competence and their mobile apps accelerator enabled us to develop a rich application for multiple Android devices. Our applications are now a part of Android market and are available on both Android smartphones and tablets.